Wool Carpet is a natural fiber that is one of most popular types of carpet for your home. Wool carpet is a natural fiber that resistant to moisture and mold. Wool is a long lasting material that wears nicely. Wool is the only natural fiber that makes it into the top four most popular types of carpeting. Wool is made from sheep that are shaved and the wool is processed into yarn. The wool is treated before being woven into carpeting . Wool has a natural flame retardant quality. Wool does not usually ignite like other fibers. Commercial buildings owners use it because of its flame retardant trait. Wool absorbs and releases moisture efficiently. Wool returns to its original state after the moisture has dissipated. Wool has natural wicking properties which is why it is used in lots of clothing. Wool is a very long lasting material. It hides dirt nicely and is easy to clean. Wool has a natural waviness which makes it one of the best types of natural insulation. Wool carpet can lower your energy expenditures as it provides a thermal insulator in the winter and a cooling protection in the summer months. Wool is easy to color because it naturally retains moisture. Dyes can be applied which will last for an extremely long period of time. This makes wool carpeting fantastic for decorating any room. People love how wool carpeting looks and lasts. Wool is used in most oriental carpets because of its capacity to hold dyes nicely. Wool tends to be more expensive than a lot of fibers because of the cost involved in processing the wool from the sheep into carpeting. Wool is easily dyed and it is easily stained. If you have younger children it may not be the best choice for your home. Call Coventy Flooring and let our experienced staff help you decide if wool carpeting will be a good choice for your home and lifestyle. Adding a stair runner to your home adds a touch of class and it can also add a safety factor. Hardwood stairs can be slick and easier to slip on than a stair runner. Stair runners can be any type of carpet or pattern. They can be elegant or simple. They can make a statement or just be a practical addition to your home. The entrance to your home is the first impression people will have of it when they come inside. 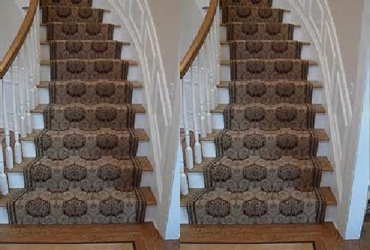 Adding a hall runner or stair runner will enhance the appearance of your home. A stair runner is typically more decorative than standard carpet and is woven and intended for stair use. Runners are typically woven using wool or synthetic pile fibers. Each fiber comes in a variety of styles and prices. Either fiber can be said to be better than the other in certain ways. They may differ in appearance and wear differently. At Coventry, we provide customers with all of the information necessary regarding these differences and will help you make the right choice for your home. 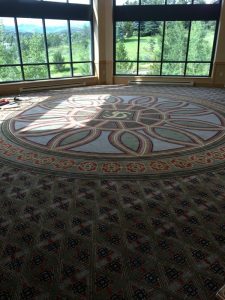 It is typically installed over a dense carpet pad with small hidden staples. This keeps the carpet from moving. Having your stair runner properly installed is essential for it to perform well and last for a long time. Incorrect installation can result in a safety risk and reduce the life of the runner. Coventry flooring deals with all types of staircases and hallways every day. It is what we do and why we have a lifetime installation guarantee. Remove shoes when entering the home or wipe your feet well on a entry rug. Keep the floors next to the runners clean. Professional carpet cleaner for your home yearly.